The Applewood Garage is a 32'x24' two-bay garage with pull-down stairs to a full Loft. It has plenty of extra space for bikes, garden tools, storage or for your use as a hobby shop. 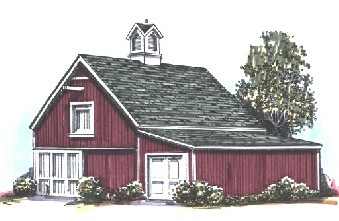 The main barn has 9' high and 10' wide doors front and back. Pull-down stairs and an outside hatch give access to a convenient storage Loft. Drawings include a variety of matching sheds that you can add to the left side or across the back for additional parking or storage. Floor Area: 768 Sq. Ft., Loft Area: 420 Sq. Ft. Ridge Height: 20'-4"